Abe Cohen Plumbing and Heating Inc. is who you need to call for residential hot water recirculation in Ahuntsic, Baie D'Urfe, Beaconsfield, Bord du Lac, Cote Saint-Luc, Cote St-Luc, Dollard des Ormeaux, Dorval, Downtown, Hampstead, Ile Bizard, Lachine, Lacey Green, Lakeshore, LaSalle, Laval, Mile End, Montreal West, NDG, Nouveaux St. Laurent, Nun's Island, Old Montreal, Outremont, Pierrefonds, Plateau, Pointe Claire, Pointe St. Charles, Roxboro, Ste-Genevieve, St. Henri, Town of Mount Royal, Verdun, Ville St. Laurent, West Island, Westpark, Westmount. 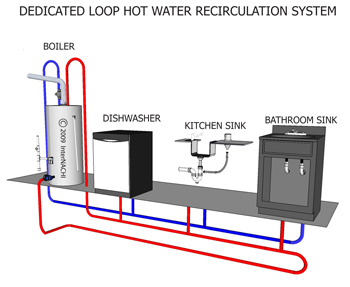 Hot water recirculation is a very simple and ingenious system that keeps hot water instantly available at its points of use. Typically several gallons of water are wasted every time we wait for hot water. The amount of water not run down the drain while we wait for hot water at the faucets depends on how frequently we draw hot water, how far the faucets are from the heater, and how much water we use. The water saved in a typical house by a hot water recirculation system can be considerable. Consider the cost of drawing and treating (softening, for example) water, or paying for metered water, or the cost and waste of expelling clean fresh water simply because it is not yet hot. The installation and operating costs of hot water recirculation are a mere fraction of the costs of on-demand hot water. When water stands at a faucet (after the flow of hot water has stopped), it cools in the pipes. One type of hot water recirculation system senses the temperature of the water near the point of use. As the water cools, the system draws a small amount of fresh heated water to this point and sends the cooled water back to the water heater. The result is that your heated water is not all sitting in a tank but is available immediately, as you need it, where you need it. New models of hot-water recirculators use valves at the points of use and use the cold water line for recirculation, instead of a dedicated return line, making retrofit installation easier. A constant recirculation system maintains hot water in all connected zones. This is easier to install during new construction or renovation. A programmable timer can add to the efficiency of the system: if you never use hot water from 11:00 pm until 6:00 am, you can have the system draw and deliver heated water starting just prior to 6:00 am. At Abe Cohen Plumbing and Heating Inc., we are a three-generation family business with more than 50 years in the plumbing trade. We consider our customers to be family and friends in a long-term relationship with us. We have the experience, expertise, tools, and equipment to repair or replace a hot water recirculation system in the greater Montreal area. We are respectful, clean, and professional. We are certified and active members of CMMTQ (Corporation des maîtres mécaniciens en tuyauterie du Québec), ACQ (Association de la Construction du Québec), and certified partners of Gaz Métro for natural gas piping and installations.